Perth enjoys a stunning setting on the wide and stately River Tay, and with its elegant architecture and spacious parkland Inches has long been known as the Fair City. The Kings and Queens of Scotland were crowned at Scone just to the north and the palace is a major attraction for visitors. Less well known are the rolling wooded hills on the fringes of town, including Kinnoul Hill with its Rhine-like tower, the obelisk-topped Murrayshall Hill above Scone and the beautiful woods of Moncrieffe Hill to the south. South of Perth are the foothills of the Ochils and then the town of Kinross. Set on the shores of Loch Leven - the largest in lowland Scotland and an important nature reserve - Kinross is the gateway to Perthshire from the south. 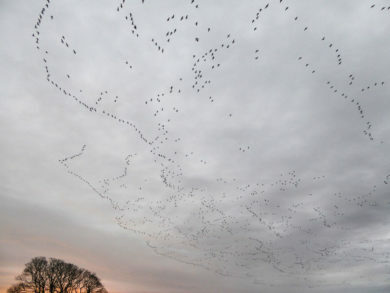 Ben Dolphin witnesses the return of the geese to Loch Leven. "At first it’s barely noticeable. A tinny resonance of indistinct origin, easily ignored amongst the background hums and whirs of the home. I stop crunching my toast and listen. The morning radio presenters are doing an outside broadcast from a noisy location..."